Despite having the highest accident rate of any U.S. Marine Corps fixed-wing aircraft, the Marines will keep the AV-8B Harrier around longer than planned. The reason is simple: Marine F/A-18 Hornets are in far worse shape and need to be replaced sooner. In 2014, the Marines were committed to retiring the Harrier earlier than planned and extending the Hornet fleet, however, after an intensive review of the Harrier fleet and the rapid aging of Marine Hornets, the Harrier will be around longer than it was expected to be a few years ago. Quirky and complicated, the Harrier has had a long history of crashes and controversy. However, as it has reached its “golden years,” the AV-8B has become a much more reliable and effective combat aircraft. A host of recent upgrades have been completed and future improvements are still planned to ensure the Harrier will be in the fight until the end. The British-designed aircraft was made famous for its ability to take off and land vertically, without the need of a full-length runway. This capability is called short takeoff and vertical landing, or (STOVL) and while the technology has thrilled air show crowds for years, the capability has cost American blood and treasure in significant numbers. The Harrier has been called “The Flying Coffin” and “the Widowmaker” due to the number of crashes and fatalities associated with the airframe since it first entered service with the Marines as the AV-8A in 1971. As the accidents became more numerous, so did the protests over the continued use of the Harrier by the Marines. But in recent years, the accident rate has dropped dramatically with the Harrier fleet. The 1980s and ‘90s were especially harsh on the community with over 35 airframe losses (including three shot down by Iraqi forces during Operation Desert Storm) and the death of 32 pilots. Losses among Marine forces were also substantial in the proceeding decade; however, the situation has begun to correct itself, and that is in large part to the Harrier Independent Readiness Review program the Marines launched in 2014, which took a very hard and critical look at the way they had been doing business with the Harrier. Not including the training squadron, the USMC had only 48 Ready Basic Harrier airframes in the summer of 2014. The review determined a need for 66 aircraft to meet basic requirements of proficiency and combat deployable airframes. After a lengthy series of improvements and reevaluation of the supply chain, the Harrier force has reached the goal established by the review and pilots are now flying the required number of monthly hours to maintain proficiency. As a direct result, thus far in 2017 there have been no Harrier incidents that have been reported as Class A Mishap, which involves $2,000,000 in damage or loss of an aircraft, or a fatality. In 2016, there were three Harrier Class A Mishaps, two where the jets were lost but both pilots recovered safely. The third incident could have been more catastrophic. On March 8, 2016, an AV-8B readying to take off on a combat mission from the USS Kearsarge against ISIS from the northern Persian Gulf, caught fire. Col. Robert Fulford, the commanding officer of the 26th Marine Expeditionary Unit, said it was a “true miracle” that the explosion did not hurt anyone. Marine Corps fighter and attack aircraft have been some of the hardest hit aviation communities during the last decade. The aircraft have been operating well beyond life expectancies and are now failing at unprecedented levels. Especially ravaged is the Marine Hornet community, and as a result, those squadrons will be the largest recipient of the new F-35s coming into service as the Marines try to get out of the Hornet business as soon as possible. Usually, we got two or three sorties out of these aircraft back in the day. We can’t do that right now. They are tried and true war dogs. They are a great airplane but they are tired. A perfect example of how badly the Marine Hornet community has been ravaged. So the service took two very drastic actions to address the problems. One step involved taking a part from a retired Marine Hornet used as a museum piece on a former aircraft carrier turned museum, and the other step was to take 23 retired Hornets from the ‘Boneyard’ that had not yet exceed their airframe flight hours, fix and upgrade them to yet another specification, this time the FA-18C+. The Marines also intend to upgrade seven former Navy jets to the same standard bringing the total to 30. The first F-35 squadron was a former Hornet squadron, VMFA-121, and while the second unit to transition is a previous operator of the Harrier, VMFA-211, the schedule has been recalibrated to push back the Harrier squadrons and replace the Hornet squadrons much sooner. This prioritization has moved VMFA-122 to next in line for the F-35, replacing a Harrier unit that was scheduled next for conversion, and the immediate two squadrons after that will also be Hornet squadrons, including standing up of the first Marine F-35C squadron which will be VMFA-314. 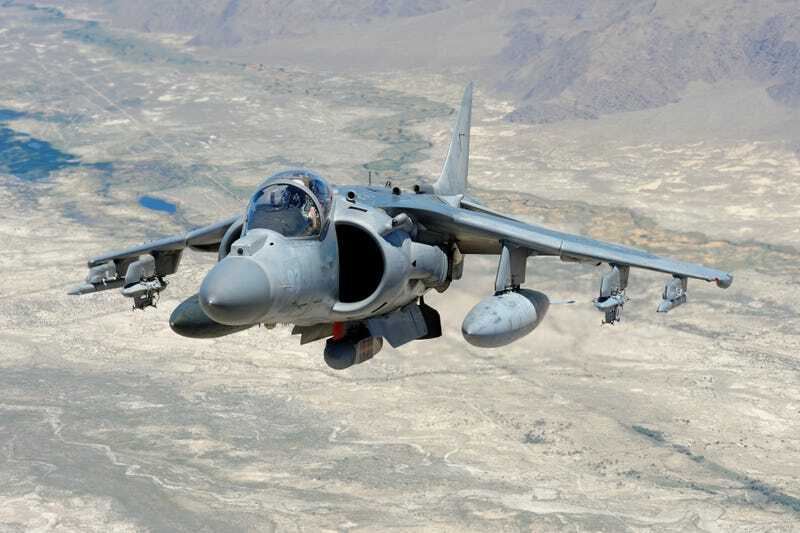 The Marines currently have 112 combat-coded Harriers today, which come in two versions. 34 are the AV-8B Harrier II Night Attack aircraft and 76 are the AV-8B Harrier II+, with the biggest difference being the Raytheon APG-65 multi-mode radar it carries. With the radar, the Harrier was now capable of acting as an air defense fighter, all-weather precision bomber and reconnaissance aircraft, and once the system was finally married to the AIM-120 AMRAAM in the last few years, the AV-8B can fulfill a fleet air defense mission for the amphibious ships it deploys with. Other key recent improvements involved full integration of the Gen 4 LITENING targeting pod, which provided enhanced acquisition and targeting, and allowed the Harrier to transmit target data to ROVER (remote operational video enhanced receiver) via the Automatic Target Handoff System which exchanges target location and imagery with other aircraft or troops on the ground. On the horizon this year is full Link 16 network integration for the radar equipped Harriers, which will allow the secure exchange of near-real-time data among linked aircraft, ships and ground stations, fully absorbing the Harrier into nearly any mission set, especially with the addition of the 500 pound JDAM, especially the GBu-54 Laser JDAM, to its arsenal, as the bomb is now the weapon of choice for most missions. Other new weapons have found their way to the Harrier include the Advanced Precision Kill Weapons System II (APKWS II), or simply a laser guided Hydra 70 2.75 inch rocket, which allows for greater accuracy, significant reduction of collateral damage and reduces the chance of friendly fire during close air support missions, which the Harrier was built to primarily support. The AV-8B was designed to be operated from the front lines, using hastily created forward arming and refueling positons (FARP), to keep the Harrier near the front lines to support Marines, or Coalition forces, in contact. During the invasion of Iraq in 2003, several Harriers landed on a runway 90 miles south of Baghdad to refuel and rearm. Despite its prickly design, the Harrier often demonstrated its versatility, especially once combat began and troops needed help. However, the front lines were brought to the Marine Harrier force at Camp Bastion, Helmand Province, Afghanistan in September 2012, when Taliban insurgents dressed as U.S. Army soldiers successfully infiltrated the base’s defenses. The resulting attack was the worst loss of American airpower in a single incident since the Vietnam War. Of the eight Harriers at Camp Bastion during the attack six were destroyed and two were damaged. Two Marines were killed, including the commanding officer of the Harrier squadron. But in true Marine resilience, two Harriers who had survived the attack by virtue of being in Qatar returned immediately and within 36 hours, another six Harriers from another squadron deployed from the North Carolina to reach Camp Bastion to continue the CAS mission to protect Marine ground elements and ISAF forces fighting in Helmand. Over the last year, Marine Harriers have been involved in nearly every aspect of American combat operations that have been conducted. Harriers have bombed ISIS positions in Iraq and Syria, covered special operations forces in Yemen and bombed Al-Qaeda in the Arabian Peninsula (AQAP) in that country. And in another fight against ISIS, AV-8Bs supported Operation Odyssey Lightning over Libya from August to December of last year. The AV-8B, the last one being delivered in 2003, was originally designed to have a 6,000-hour airframe, and those flight hours were anticipated to be exhausted by 2012. However, the Marines and the Department of the Navy began to look at it differently than just a static number of hours the plane could fly before it was expected to wear out. It was determined that the Harrier would be able to fly well beyond the original 6,000-hour estimate. The Harrier inventory with this new criterion is estimated to have exhausted less than 40 percent of its useful life. That is fantastic news for the Marines, who chose to skip a generation of airplanes—namely the FA-18 Super Hornet—to focus instead on the arrival of the F-35. While that decision may have been questionable, and likely wrong, the arrival of the F-35 in the numbers they need it to will relieve the pressure on these old aircraft failing at an amazing rate. Yet, the arrival of the F-35 is not without its own well-discussed problems. One thing is certain: The Harrier will remain a vital part of the Marine inventory for at least another decade, living on longer than many thought it would, or should have.